A healthier lightened-up curried chicken salad sandwich packed with protein, fruit, and vegetables in each bite. Great on top of salads, crackers or as a side dish! Savory, crunchy, nutty, sweet and creamy all in one bite. You got it! How can all of these amazing things happen at one time? It’s all mixed in a luxurious curried chicken salad sandwich, oh yea! Do you need a quick lunch or meal prep idea, or have a big party coming up? This lightened-up chicken salad is one delicious solution known as comfort food. Lean sauteed chicken breast is seasoned with earthy spices, Greek yogurt and tossed with fresh ingredients to make each bite satisfying and irresistible. You know a recipe is going to be yummy when the elements combined look like a rainbow! It means that you are getting more nutrients in each bite, and that’s always a good thing. Everything in this chicken salad sandwich recipe has a purpose so that you have the best eating experience; flavor, color, texture, and nutrition. Chicken breast is an excellent source of protein that is low in fat and easy to prepare. I sauteed the chicken breasts, but you can bake, grill or use roasted chicken. If you’re looking to turn leftover cooked chicken into a meal, this is the perfect recipe for you! The magic is in the curry yogurt dressing. A little bit of curry powder goes a long way and adds an earthy and fragrant aroma to the chicken salad. Instead of thick mayonnaise, I used protein packed plain nonfat Greek yogurt to give the creamy mouth-feel. Some brands sell whole milk Greek yogurt if you’re missing the richness from mayo but want your meal to be healthier. The recipe gives just enough dressing to coat the ingredients. If you want an even creamier salad, double the curry, yogurt, and salt for the dressing and add as much as you like! Grab me a fork. I’m ready to dig in! The crisp celery and red onions enhance the savory curry powder while the crisp apples and dried fruit add a hint of natural sweetness and balances the tang of the yogurt. Don’t forget those lovely chopped cashews! I know what you’re thinking, how can I get one of these sandwiches air shipped, pronto! I would totally send you one if I could, but this curried chicken salad sandwich recipe is so easy to make that you’ll have everyone noshing even before I had the chance to hit the post office. Pinky swear! This recipe makes five generous sized sandwiches, so I had tons of leftover. I packed some for lunch to add to my green salad and guess what? It was even tastier the next day. The spices and flavors had a little more time to marinate, and each bite was even more delicious. The chicken salad is a nice base to serve alone as a side dish, mini sliders, on top of salads and crackers too. I would love to hear your creative way of serving this chicken salad recipe! What is Curry Powder and how do you use it in cooking? Curry is a general name to describe a blend of different spices to add flavor, aroma, and color. It’s most commonly found in Indian and South East Asian cuisine. There are many variations from mild, sweet or spicy (madras). Ingredients often used are cumin, coriander, and turmeric plus black pepper, mustard, cardamom, ginger, clove, chile pepper, cinnamon, fenugreek or bay leaf. Curry can have a floral, savory, warm spice, and earthy scent when cooked. It helps to heat the dry spice in a pan or with oil before cooking to enhance natural oils in the flavor. This versatile seasoning can be used in sauces, soups, stews, or as a dry seasoning for meats and vegetables. A little bit goes a long way, so if you are experimenting add a small amount at a time until you get to the desired spice level. Heat a large saute pan over medium heat and add 1 teaspoon oil, add more if needed to coat the surface of the pan lightly. When the oil is hot, add the chicken breasts. Cook for about 5 to 6 minutes on each side, or until flesh is no longer pink and internal temperature is 165°F. Allow chicken to slightly cool, then cut into ½ inch cubes. 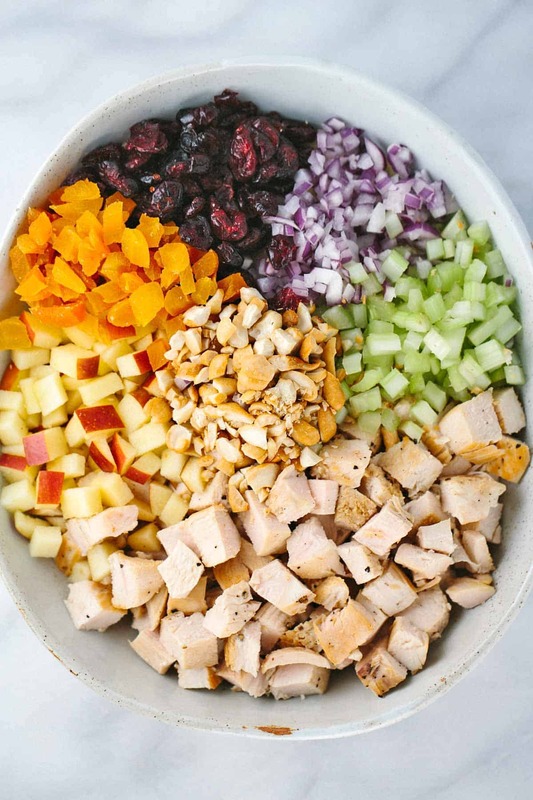 Add cooked chicken, celery, apple, onion, cranberries and nuts to a large bowl. In a small bowl combine yogurt, curry powder and ½ teaspoon salt. Add dressing to chicken mixture. Toss until combined. Season with salt and pepper as desired. Fill each sandwich with the chicken salad. Store in an airtight container for up to 2 days refrigerated. 1) If you already have cooked chicken, cut into ½ inch cubes or roughly shred. About 3 cups chicken is needed for this recipe. 2) I like to buy thinly sliced chicken breast because they cook quicker. You can also slice the breasts in half to create two thinly sliced portions. 3) If you like a lot of dressing on the chicken salad, double the yogurt, curry powder and salt mixture to yield 1 cup dressing and add as much as you like. 4) You can use any dried fruit. I used a combination of cranberries and chopped apricots. Dried apricot, mangoes, cherries or pineapple would also be delicious. 5) You can substitute the cashews for walnuts or almonds.